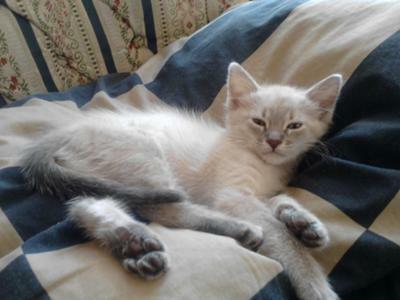 Cry Baby is half Domestic Shorthair (tortie) and half Siamese. Her father is one of the feral cats that live in the local transportation center. The entire colony is made of up wedge type Siamese cats. I got Cry Baby when she was around five weeks old from the groundskeeper at my university in Mexico City, where I still live and study. This is a normal age for kittens to go to new homes here, unfortunately. Her being so young is where she got her name, as she would cry as soon as she was alone and seek me out. She was bottle-fed for a while and then transitioned fairly easily to solid kitten food. 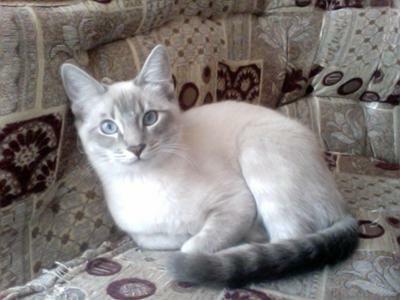 She is now a rambunctious seven-month-old with striking blue eyes and a bold personality. She loves shoes and will attempt to steal them off your feet, if given half a chance! So far she has had no health or behavior problems, and I hope to have her in my life for a long time to come. Welcome, Breanne and thank you for sharing your pictures of Cry Baby. 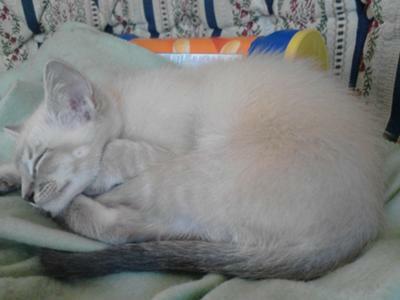 It's fun to see a Lynx Point Siamese (from her pictures she looks like a Blue Lynx Point) at different stages of development - the changes and darkening color patterns are quite apparent. She has a gorgeous face and tail! Interesting that she clearly inherited her father's Siamese genes and not (from the look of her) any of the tortie ones. How fascinating to have an entire colony of feral Siamese. Well done you for bottle-feeding her and bringing her up so well - five weeks old is very young for a Siamese kitten to leave its mother, but you must have done a great job as she certainly looks very happy and contented. My lynx point Siamese is now six months old. She is a sweet loving little girl but she bites too, just started doing that, she bites hard enough to bring blood. She has a wild side to her, meaning she gets into everything and loves to destroy any kind of paper including wall paper. If she is quiet she is into something. Her name is Mia and she looks just like Cry Baby. I love her to pieces, but I'm not sure if she will outgrow all this, everyone says it is the kitten in her. I sure hope she does outgrow this, but someone told me if she is six months old she is set in her ways. That's a scary thought. I have a lynx point, Chloe, who is beautiful. Yes she bites. I think these cats are amazing! So smart it's like having a little dog. Follows me around and always talking. She cries (meows) in her sleep - unsure why. I adopted him recently and he's mean. I bought him everything he needs. He loves all his toys. Very playful cutie pie. His favorite toys are my hands and face. I try to not allow him to bite me but he catches my hands or face very fast. For some reason he doesn't like to be petted and hates belly rubs. He asks for a lot of attention which I always give him. He follows me to every room. He sits next to me all the time. He waits for me to get out the bathroom. I want an affectionate cat that I can call my best friend. He is a year 1 1/2 so I know he will change I just hope his ways won't be permanent. I really would love all the advice that can help with this issue. I want to be able to keep him around. Now that Cry Baby is two and a half years old, she doesn't bite nearly as often. When she does, though, she means business. Only broken skin on me but has bitten pretty much everyone I live with. It's mainly when someone is petting her. She enjoys it for a short while but suddenly doesn't and lashes out with tooth and claw. For whatever reason, she just doesn't jump off the chair and leave but tells you "no" in her own way, however painful that ends up being. I live and work with all kinds of animals, so her personality is no real hardship on my part. I'd take my lynx point being angry at me any day over one of my ball pythons or pet rats, lol. 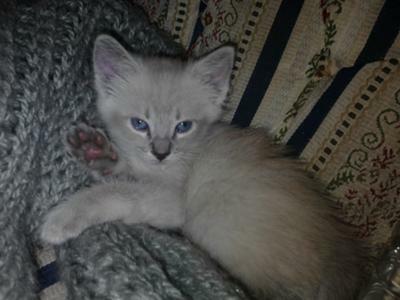 I have a lynx point Siamese cat that's a male. All the while I am petting him and I start to rub his belly, he starts to bite. At first it's a love bite, then he gets angry and bites really hard then walks away. Hard to say if this is normal or part of being a lynxie. Hope that helps! I have a Lynx Point Siamese that I named Lexi. I read a comment or two about the breed being biters. I have never experienced that with my cat. She is very sweet, loving, and friendly. I adopted her from Paws Animal Shelter in West Linn, OR and she is my very best friend! Cry Baby was spayed at a year old and her behavior calmed down a good deal. Now at 15 months and inflicting a few scratch and bite scars, she seems to finally be settling in her skin, so to speak. Don't give up hope for a non bitey cat! Cry Baby now really only bites to break skin when frightened or surprised. She has [at long last] learned to play bite. I'm very sure she was taken away from her mother and siblings at too young an age, so she really never learned to play nicely. I also found that engaging her in training activities helped her behavior. This is how I discovered how smart she was, lol. She learned sit and stand up in one afternoon! I was impressed, none of the cats I've had in the past picked up what I wanted them to do as quickly as she. Of course, she also gets easily bored with repetition once she gets a trick. Intelligence is a curse, I suppose. Anywho, best of luck with your Lynx Point, Jennifer! I hope he grows out of his painful habit soon. Thank you for the response, I'm hoping that my lynx point Siamese grows out of it after he's neutered because he bites so hard and so much he's breaking skin. Actually, yes. Cry Baby does have a problem with biting. I don't know if it's because she's a lynx point or because she's half feral cat. I just try to correct the behavior with a firm "No" and ignoring her for a bit. I also praise her for gentle playing and letting me pet her for lengths of time. She's a beauty. I wanted to ask you if she ever bites? I have a 4 month old male and he can be fine one minute then he'll bite the next. Is this normal because it doesn't seem so to me. Thanks. Sounds like my boy Willie. I rescued his mom, a solid black Manx from a local grocery store, she blessed me with three kittens in a few weeks! A tuxedo female with no tail, a male lilac point no tail, and Willie who looks just like your Cry Baby, with a tail. Found great homes for the two and kept Willie! Best decision I ever made! Love him to the moon and back, and he has a very loud and needy meow!